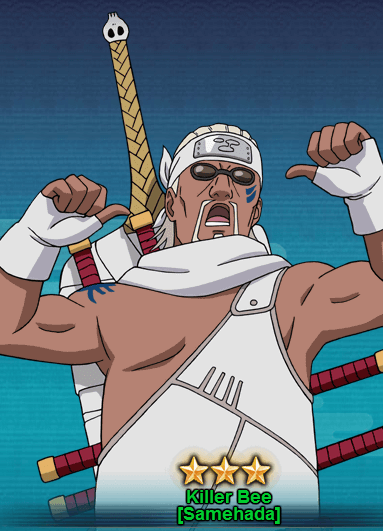 As I’ve described about Killer Bee in Killer Bee [Seven Swords Style] ninja character guide. I will move directly to the abilities overview and how to get Killer Bee [Samehada]. Ninjutsu Lightning Armor [Prompt]: When used, will launch 3 Standard Attacks this round, simultaneously, this skill will increase this unit’s Critical Hit Rate by 15%, lasts for 1 round. Taijutsu Shark Skin Attack: Attacks the opponent’s front row and absorb up to 20 Chakra points and has a chance of a 3 COMBO, Low Float and Acupuncture. Ninjutsu Shark Skin Expansion: The higher your Chakra points, the higher Killer Bee’s Critical Rate and COMBO Rate. Becomes effective with at least 40 Chakras. Ninjutsu Tailed Beast Chakra: Before each action in a round, recovers Life based on its Ninjutsu attribute and becomes immune to all Debuffs. Taijutsu, Ninjutsu Lightning Plough Hot Sword: Chases and Attacks a Knocked Down unit, causes High Float and Paralysis. You can get Killer Bee [Samehada] from the Jinchuriki 1 Treasure. It will take almost 60-70 seal scrolls draw to get Killer Bee.